Our Zone 4 garden has a frost free average date of May 15th. Most years I play it safe and plant my tender plants and vegetables in the last few days of May or early June. But mid April does bring some flowers. My first bloom in April was Hellebore. I grow this in zone 4 protected by a juniper tree. Does anyone know if i dare move it? Do any other gardeners in zone 4 have success with growing hellebore? I think I bought this from zone 5. PS: Yesterday, I was c leaning up the garden around this lovely plant and saw that that there were 2 or 3 little seedlings! So I will move them! Species tulips self sow in my front boulevard garden. These short “flags” Iris are fragrant. The deer will walk right by them. I also have blooming daffodils, periwinkle and some of the wooly veronica. You have to love Hellebores...they seem so reliable! Your tulips are beautiful. I'm impressed your 'flags' aren't interesting to the deer. Sounds like something I should add to our 'try it outside the deer fence' list! They are beautiful bursts of color!! Love the yellow, especially. Hi Clare- Yes, the flags are very fragrant. I'm not sure of their name. They are an short little iris with a rhizone. They are a pass-a-long plant. A bit of them came with the yard. They are quite fragrant. I have been transplanting them along the sidewalk. The deer seem to like walking on the sidewalks instead of the street. Isn' t that funny! Hi Jeanne - the species tulip is so short. They reproduce very easily. I am getting quite of few of them. Now the wooly veronicas are blooming around the yellow. I love yellow and blue together in ground covers. Ooh, hellebores, yummy! I've got 'Ivory Prince' in the backyard. It is alive, but not much better than that at the moment though the snow has been melted around it for a few days. No blooms yet. I had it for three years before it bloomed for me. I'm envious you have seedlings! Gloria, love your hellebore, and to have seedlings!!! I do not know about the moving, I get the impression once they are established they do not like to move, but I could be wrong. The iris are so pretty, I need to look for that type. I didn't know species tulips self seeded, another reason I need to plant some this fall. Deborah, I do believe you are right. The hellebores have a taproot. I just love your hellebores and iris. How interesting that the tulips self seed. They are so pretty with their little yellow faces. Noelle, the little species tulip are very short and they reseed. On bad "deer years" they get eaten or trampled down. But this year is good. Hi Kate - when you come by I will send some home with you. Do you know the name of this little rhizone iris. I need to see if it is a Dakota native. A start of this plant was in our yard when we moved in 18 years ago. I've since spread them around. Just found your blog from MaryJanes Farm and I love it! I am a gardener as well! 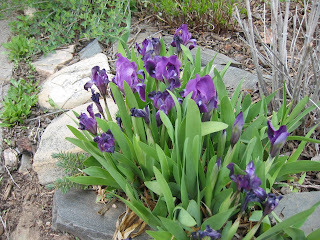 I love the early blooming irises! Mine are all still just foliage. I'm a hellebore newbie - just planted my first five this month. Best of luck relocating if that's the decision.